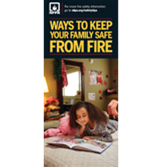 Help protect families in your community from the danger and devastation of fire! There are many ways to keep families safe from fire...yet many people are still in the dark and don't know important information such as: turn off space heaters when you go to bed...the safe position for pot handles on the stove...where to install smoke alarms...the proper type of ground fault protectors to have installed...the type of circuit breaker that shuts off electricity in the event of a dangerous condition...and more. Five checklists covering smoke alarms, electrical, heating, smoking, and cooking. Knowing when to have the heating system inspected. Where to install carbon monoxide alarms. One must-have item if a home has a fireplace. Best type of smoke alarm installation to ensure the best protection.